Detailed accurate information is what consumers crave. It’s no different when it comes to your inventory. Merchandising matters and your first impression is the information provided via your website. The eBait Inventory manager is a robust merchandising engine designed to detail each piece of inventory’s unique selling proposition. With our propitiatory Inventory Decode system, we can save time and provide proper brand management when selling inventory and our flexible pricing allows companies virtually unlimited options to showcase price discounts, rebates, and incentives. eBaits unrivaled, automated comment GENie provides shoppers and search engines with information each can use to determine market value. Advanced filtering and inventory options sorting ensures each value proposition is easy for consumers to locate and understand. Mobile marketers will see higher SRP to VDP conversions courtesy of our dynamic Image overlays and “first-photo corner clings” that call out unique selling features. The eBait inventory merchandising engine makes it quick and easy to merchandise your business' inventory. Our system will automatically apply factory rebates, update prices, quantities, and more while pushing all this information straight to your website. When it comes to merchandising vehicles, eBait has no equal. Our systems are capable of being integrated with any DMS, and our system's built in inventory barcode-based scan-n-shoot photography system has no equal. Our inventory barcode-based scan-n-shoot photography system system will dynamically adjust all your product's published prices based on your selling specifications, outfit new, certified, or used inventory with automated photo overlays, add DMS-extracted safety and maintenance upgrades to any generated seller's notes, and more. With over ten million decoded explosions, our inventory explosion engine is the most finely tuned merchandising automation machine on the market. 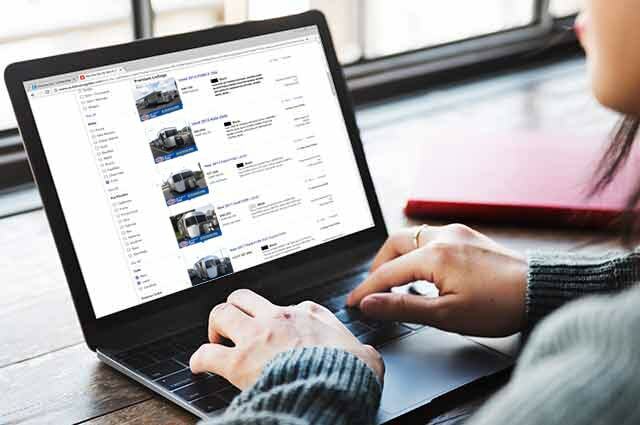 The eBait system creates detailed inventory reports instantly identifying any missing critical inventory information like floor plans, seller’s notes, current or available colors, engine size, hull design, transmission, mileage, entertainment features, and more. It also makes it easy to fill in any information gaps to ensure your presented merchandise is never lacking. Between our advanced merchandising systems, detailed reports, and experienced team of professionals, consider eBait International your inventory value storytelling team. We have over 20 years experience in helping companies sell their stock. We monitor and make recommendations to every client’s inventory to guarantee their product will move.